1. Place the flours and salt in a bowl, make a well in the centre and add the egg. Then gradually beat in the milk to form a smooth batter. Set aside. 2. Melt the butter in a frying pan and gently cook the leeks for 4–5 minutes until they have softened. Add the garlic and mushrooms and cook until softened. 3. Meanwhile, heat a little oil in a frying pan. Once hot, pour a little of the prepared batter into the pan, and rotate it around so that there is an even layer. Cook for 1–2 minutes until the surface is firm to touch and slightly darker in colour, then flip the pancake over and cook for 1–2 minutes, or until golden. Set aside and keep warm. Repeat to make 4 pancakes. 4. 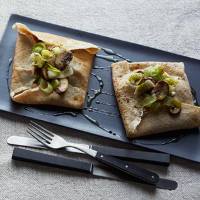 Divide the leek mixture between the pancakes, top with a generous cube of the Boursin, and serve with the sides folded in towards the centre.